In its 19th year, the Jerwood Drawing 2013 prize again delivers in its aim to “explore and celebrate the diversity, excellence and range of current drawing practice”. 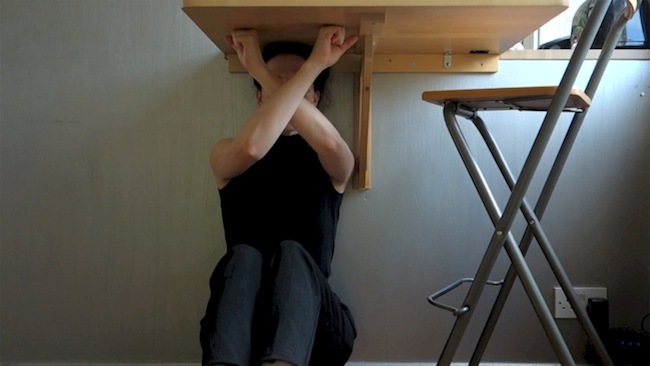 Selected from over 3,000 entrants, 76 shortlisted artists including the four prize (and two Special Commendations) winners will exhibit their work at Jerwood Space in Bankside, London from 11 September – 27 October 2013. The Jerwood Prize 2013 was juried by Kate Brindley, Michael Craig-Martin RA and Charlotte Mullins, who judged the work from the perspectives of curator, practitioner and writer. They awarded four artists a total of £17,000 in cash prizes, along with two other winners of Special Commendations. Svetlana Fialova, ‘Apocalypse’, 2013, ink on paper, in ‘Jerwood Drawing Prize 2013’, at Jerwood Gallery, London. Photo courtesy the artist. 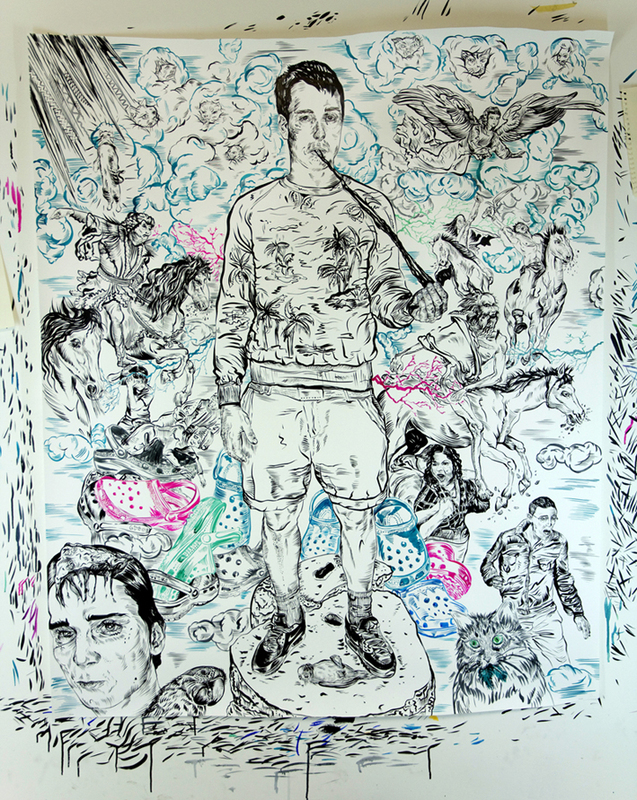 Svetlana Fialova won First Prize for the 2013 open competition with a large ink drawing on paper, entitled ‘Apocalypse (My Boyfriend Doesn’t Care)‘. Fialova’s boyfriend is the central figure of the piece seemingly unperturbed by the scores of wacky cats surrounding him alongside people riding horses. Fialova is currently studying for a PhD at the Academy of Fine Arts and Design in Bratislava. She lives and works in London and Prague. Two videos feature in this year’s Drawing Prize: Maria von Heyl won Second Prize for her performative video work of her interacting with a home environment, entitled, ‘Interior (Utopia)‘. Neville Gabie was awarded Special Commendation for ‘Experiments in black and white VII‘, a short film of him dragging a large piece of chalk stone to make deliberate marks. 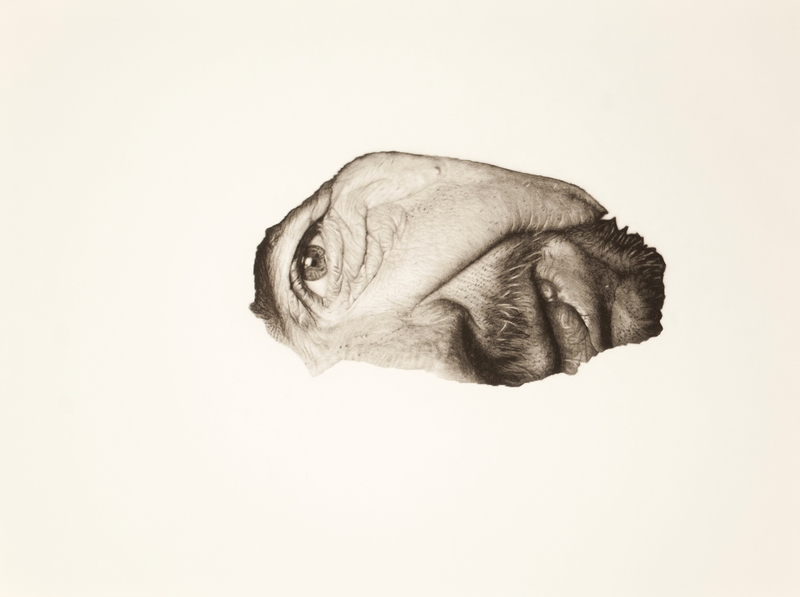 Kristian Fletcher, ‘The Wrench’, 2013, charcoal and pencil on paper, in ‘Jerwood Drawing Prize 2013’, at Jerwood Space, Bankside, London. Image courtesy the artist and http://www.artfund.org. The work of two students was selected from 24 entries to win £2,000 each. Kristian Fletcher submitted ‘The Wrench‘ a dark and moody work related to his interested in architecture or landscapes undergoing change; he studies at Prince’s Drawing School, Shoreditch, London. 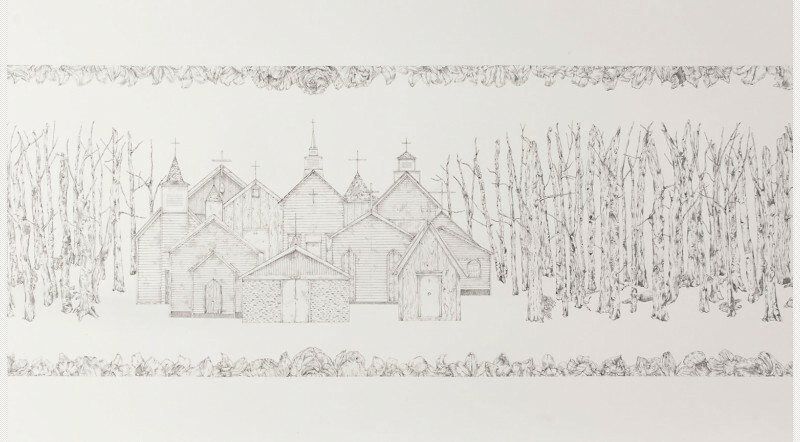 German student Tamsin Nagel from Royal College of Art won a prize for ‘Enclave (ii)‘, a quietly elegant line drawing in which a group of churches is surrounded by a forests and fields. And then unsettlingly, you notice the scene is strewn with dying livestock. While the range and variety of the types of work on display is certainly impressive, (it includes animation, iPad drawing, videos and 3-D pieces as well as more conventional pencil-on-paper submissions), a black and white palette seems to prevail throughout the show this year (of course, with the exception of Gary Lawrence’s bright orange ‘Saint Stansted (and Other Stuff)‘ piece). This sparse use of colour is not a disappointment by any means and the limited palette seems to put very few boundaries on an artist’s expression. Actually, it’s nice to see more ‘traditional’ methods taking centre stage after the recent trends of using anything-but, calling it a drawing and then working backwards to justify it as such. Justar Misdemeanor, ‘Soldier’, 2013, charcoal on paper, in ‘Jerwood Drawing Prize 2013’ at Jerwood Space, Bankside, London. Photo courtesy http://www.degreeshow.mmu.ac.uk and the artist. This life-sized image of a soldier by Justar Misdemeanor is one of my favourites from the show. 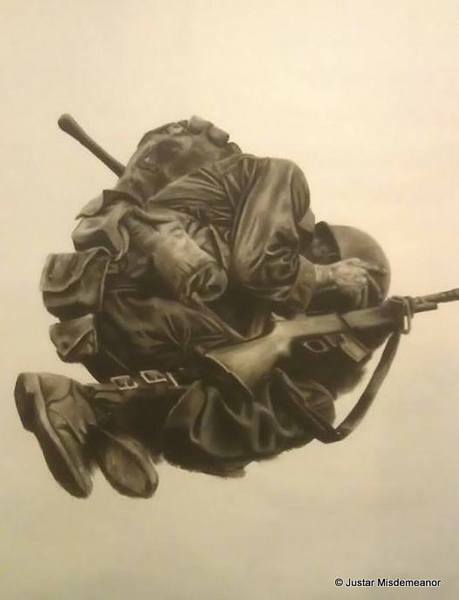 Maybe because my brother is a soldier, I don’t know, but I am really taken with the expressive quality of the charcoal marks together with the pose of the figure. The image of this man really grabbed me and held on for quite a few long minutes. I presume him to be a strong and fearless hero, yet he’s curled up in a feotal position, his weapon at his side, rendered seemingly helpless by something we onlookers can only imagine. If you’re in Bankside anyway, maybe to see something at Tate Modern, the Jerwood Space is practically around the corner; it’s free and always worth the visit. They also have a lovely cafe and meeting space adjacent to the gallery (with better treats, in my opinion, than Tate’s ground-floor cafe). 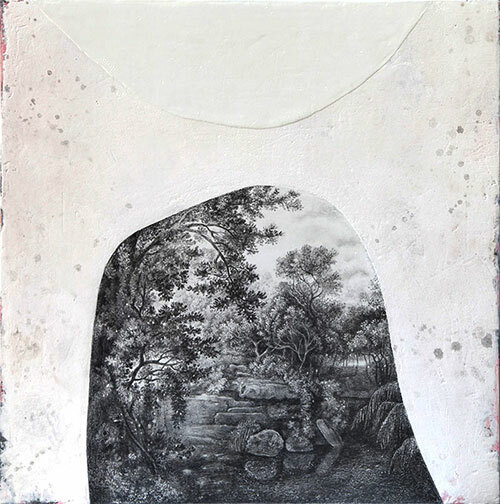 Drawing is highlighted at Wimbledon BA Degree Show 2013 – Wimbledon College of Art has long-standing connection with Jerwood. 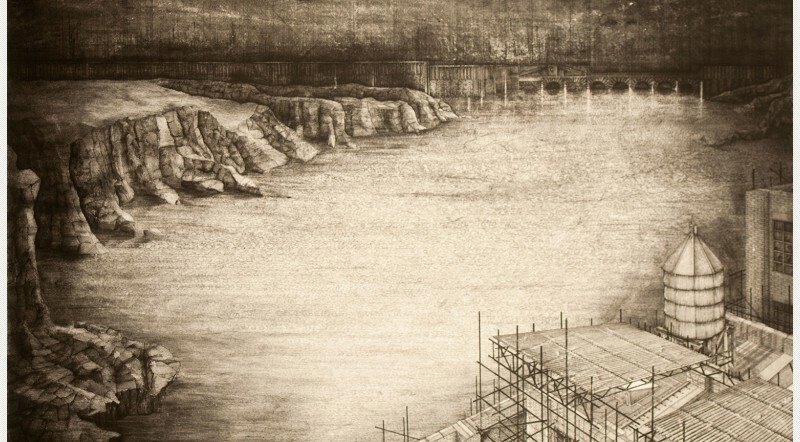 Exhibition details: The Jerwood Drawing Prize 2013 exhibition is on at Jerwood Space, Bankside, 171 Union St, London SE1 0LN from 11 September – 27 October 2013. Free.